Home Get your priorities right! 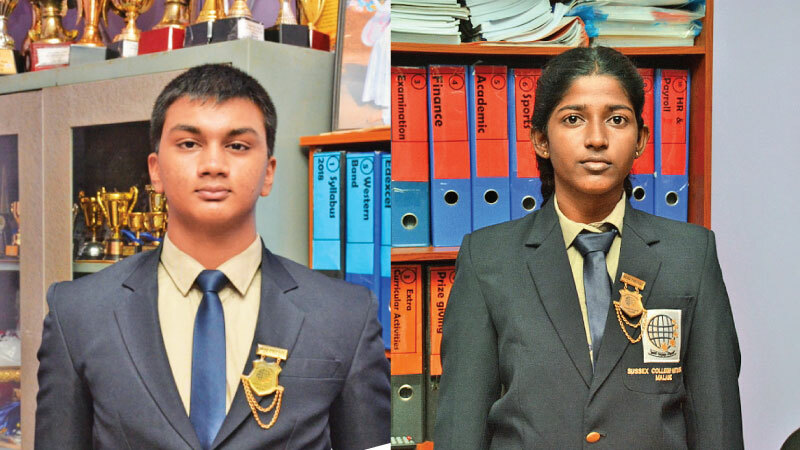 Qualities instilled in the minds of Head Boy Sam Gunawardana and Head Girl Oshadhi Jayatillaka of Sussex College, Malabe, has allowed them to become efficient leaders in their own right. 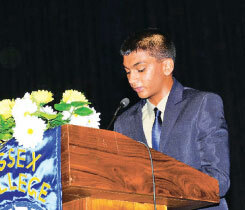 Head Boy of Sussex College, Malabe, Sam Gunawardana is a chess player and thinks like a chess player. He says that he always thinks ten steps ahead of him. He always has more than three plans. If one fails he has a back -up. The art of playing chess means that you need to be tactical and Gunawardana is precise when it comes to formulating a plan of action. Gunawardana is always the pragmatic one. He does not believe in being pressurized. He understands that worry is unproductive and that if you are constantly in a state of worry you will not get anything done. He says if you just put your mind to the task you will be fine. “My secret to success is actually God. He has been by my side right through my tenure as Head Prefect helping me face my challenges. I rose through the ranks to where I am now and I thank God for granting me this position. God has brought me through the hard times and given me the life I have now,” said Gunawardana. Gunawardana pointed out that there are so many problems in the world today such as War, terrorism and corruption. “The only alternative for us is to change the mentality of young people. As young people we need to think to ourselves – what can we do to change our country? I think self -belief is the key here. My message to the youth is to always believe in yourself and do not doubt yourself. Live your life to the fullest. I can see so many youths wasting their lives and wasting their time. You need to be confident. Give priority to your studies and extra-curricular activities. The rest will come later,” explains Gunawardana. He also stated that his father and mother have always been cheering him on. His father will always find a way to help him. Both of his parents have been great pillars of strength and always made time for him. 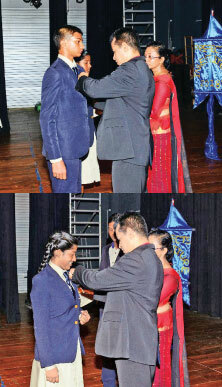 He also thanked his principal Nishanthi Rathnayake for believing in him and being there to guide him. Last but not least he thanked his Head Girl for her unwavering support. Head Girl of Sussex College Malabe Oshadhi Jayatillaka’s leadership prowess comes from her love for her school and having received so much from the school she wants to give back to the school and give back to society. “My school gives its students so many opportunities to bring out the hidden talents of its students, be it academics or sports. For any student being at their school is a life-changing experience. We need to believe that we can make a difference and we need to be passionate about creating change,” said Jayatillaka. She also commented that school time is precious so one should make the most of it and give 100 per cent to school life. It could be in academics or sports. She emphasized that one should not grow old and look back with regret. “I think when it comes to issues in the world, one issue that I feel strongly about is Child Abuse. This is because of the vicious cycle. The child’s life is shattered by the abuse he or she experiences and then he or she becomes the oppressor and hurts other children. So many lives are shattered by child abuse,” explains Jayatillaka. 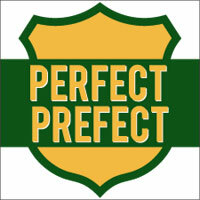 Jayatillaka feels that handling pressure is a leadership quality. Not everyone you meet in the world is the same. You need to interact with different people. The key is not to break under pressure. She pointed out that her school has allowed her to discover her strengths and in doing so she has grown up under pressure. Pressure is a part of life. “The love I have for my school is beyond words. I would do anything for my school. I must thank my beloved Principal Nishanthi Rathnayake and all my dear teachers for making me realize that it is always hard work that gives you results. Talents and other interests are just stepping stones on the journey towards success. Hard work is the deciding factor when it comes to who succeed in life, and those who fall short of the mark,” explained. Similarly to Gunawardana, Jayatillaka too feels that her parents are a tower of strength to her and that her school can make a leader out of a student provided that the student is willing to be transformed. “When I first entered Sussex College Malabe I was very nervous and timid, and now here I am – the Head Girl of Sussex College, Malabe. Leadership means having the self- confidence to believe that you can make a difference and having the passion to believe that it matters and having the courage to risk it all because you believe it matters,” pointed out Jayatillaka. 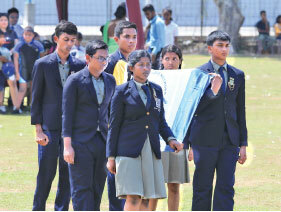 She also pointed out that being the head girl is not competing against the other students. It is about making sure that each student gets over the finish line. It is about mentoring which will enable each and every student to take their school to greater heights of success – with love, dignity and grace. This is what she wants for Sussex College. “Having Goals and making sacrifices are a part of life. As Head Girl, I have a vision and that is that there is no limitation as to what we can achieve. My mission is to put my vision into action,” added Jayatillaka. Both Prefects made special mention of the School Music Band agreeing in unison that all successful journeys lead to great destinations, started off as a single step. This is especially true of the Western Band. In a short period, the band has really excelled and the band leader is responsible for such good results. 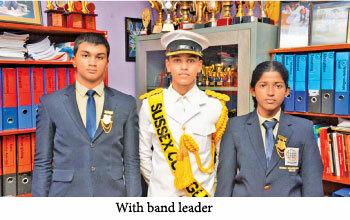 This year they were able to win the Best Band in inter-school Sussex Band Competition and Best Band in the inter-school band competition.